Catching up with an event from the ‘summer’, the theme for this year’s Festival of Speed was ‘Full Throttle – The Endless Pursuit of Power’. Centred around a hill-climb through the estate, current and historic motor racing cars, bikes and drivers hurtled up the tight course which passes Goodwood House and the BMW central feature sculpture. The modern cars included Formula 1 teams and 2016 season drivers or test drivers, plus others from the more recent past. Also on show were the motoring industry’s latest models, from family hatch-backs to the fastest supercars – all looking for customers. Although the weather looked promising in the morning, it soon closed in to become overcast and wet. On the night of 16/17 May 1943 nineteen specially modified Avro Lancaster bombers of 617 Squadron Royal Air Force departed Scampton in Lincolnshire bound for the Ruhr Valley deep in the heart of Germany. Targets for the night were the Möhne, Eder and Sorpe dams using the Barnes Wallis ‘bouncing bomb’ with the intention of striking a blow at the industrial production of the area. The attack – titled Operation Chastise – caught the imagination of the British public which had hitherto had little in the way of positive news through the early war years, and also proved the effectiveness of precision attacks against valuable targets. 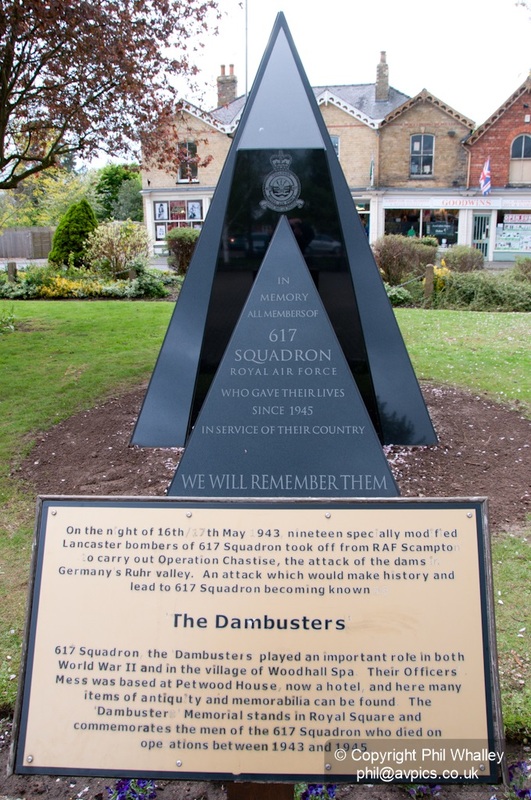 617 Squadron was specially formed for the raid and would forever be known as The Dambusters, with their motto becoming ‘Après moi le déluge’ French for ‘After me, the flood’. 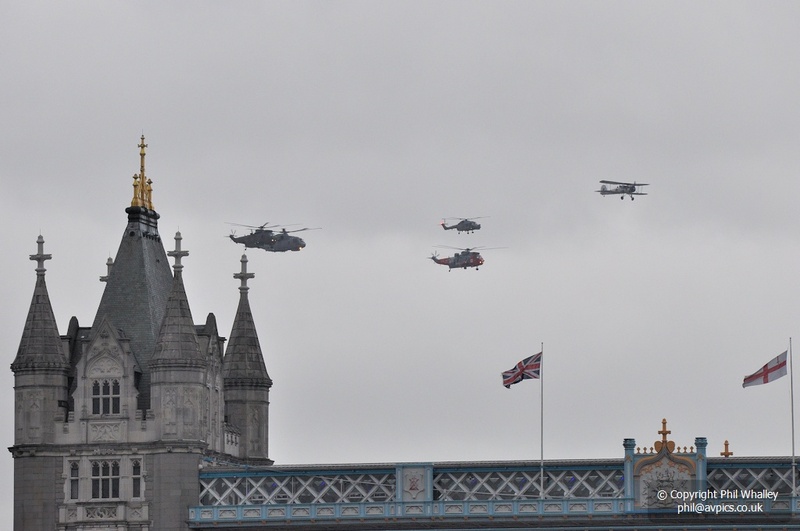 The seventieth anniversary of the raid would see a number of commemorative events involving the current RAF 617 Squadron and its Panavia Tornado GR4 jet bombers, the Battle of Britain Memorial Flight’s Avro Lancaster and a number of locations linked to the history of the event. 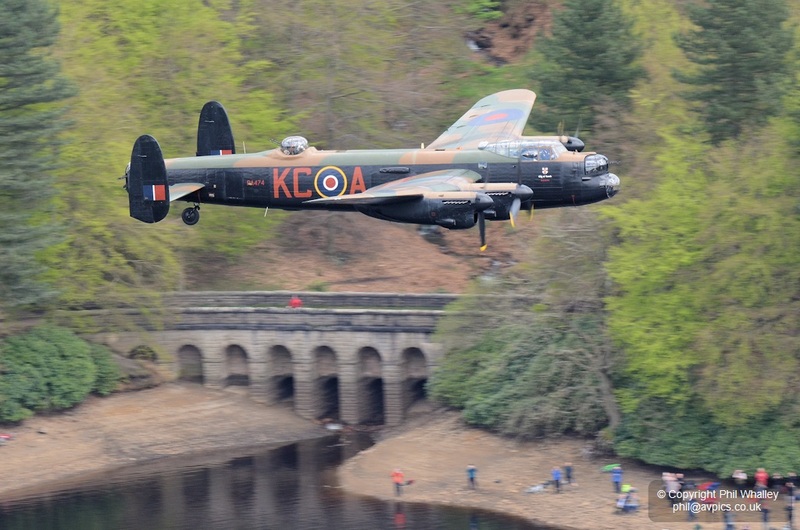 Whilst the ‘bouncing bomb’ – more correctly a mine – was tested in locations such as Chesil Beach, Dorset and Reculver, near Margate, Kent, the bomber crews practiced their attack approach for the dams using most famously the twin-towered dams of the Derwent Valley in Derbyshire. 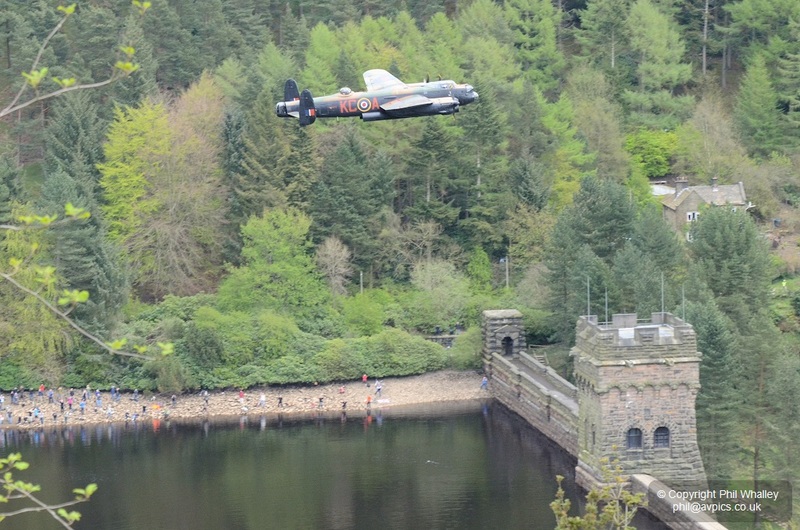 For the anniversary events this would be the location for the most visually dynamic; a flypast at low level over the Ladybower Reservoir by the BBMF Lancaster and a pair of 617 Squadron’s Tornado jets, both of which had been specially painted with their tails depicting the breaching of the dams. 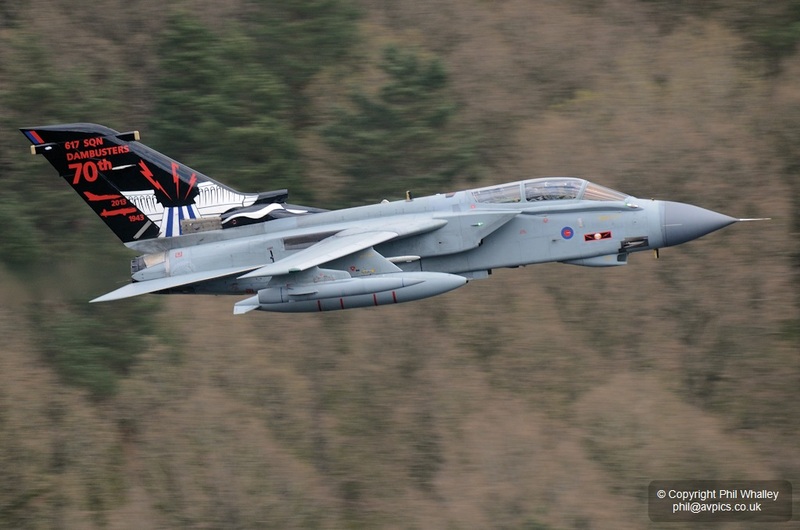 Getting photographs of the aircraft involved climbing the valley walls to around 400m – but was well worth the effort! 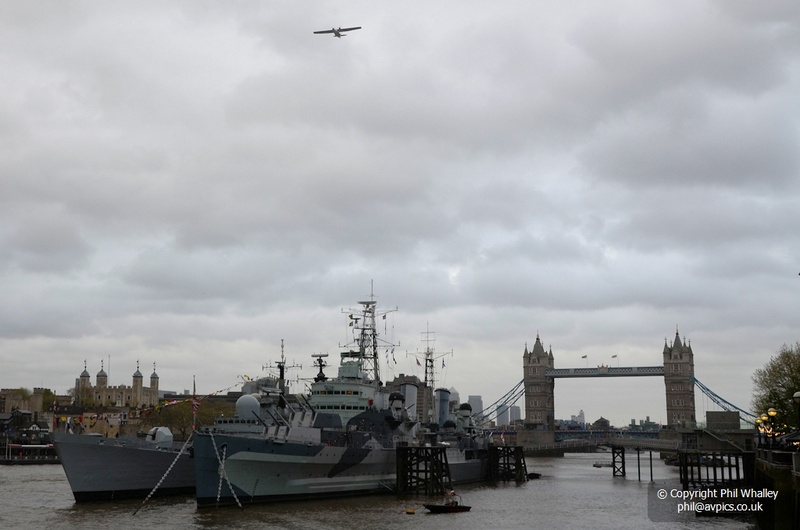 The Battle of the Atlantic, the longest continuous military campaign in World War II, is being commemorated in a series of events marking the 70th anniversary of the climax of the battle, May 1943, when Germany’s submarine fleet suffered heavy losses in the Atlantic. Over the course of the battle, thousands of merchant ships and tens of thousands of lives were lost. 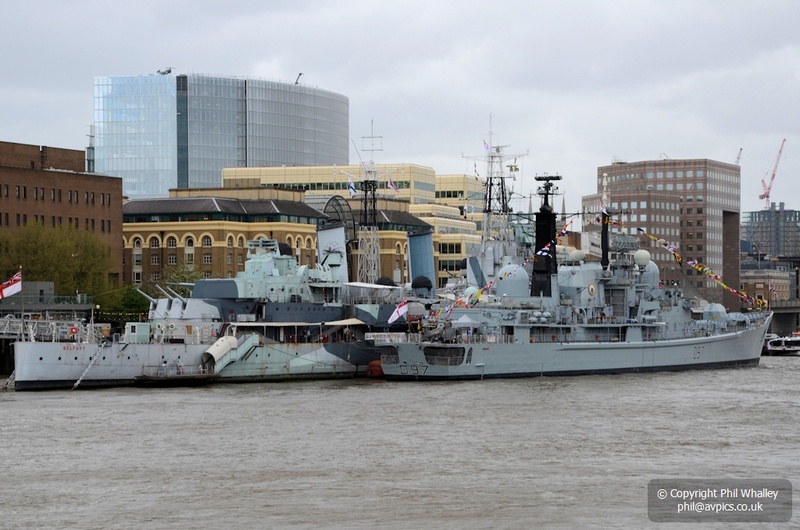 Three Royal Navy warships arrived in London before a special evensong service at St Paul’s. HMS Illustrious docked on the Thames at Greenwich on Wednesday, following the arrival of HMS Blyth and HMS Edinburgh, the latter going alongside museum ship HMS Belfast. 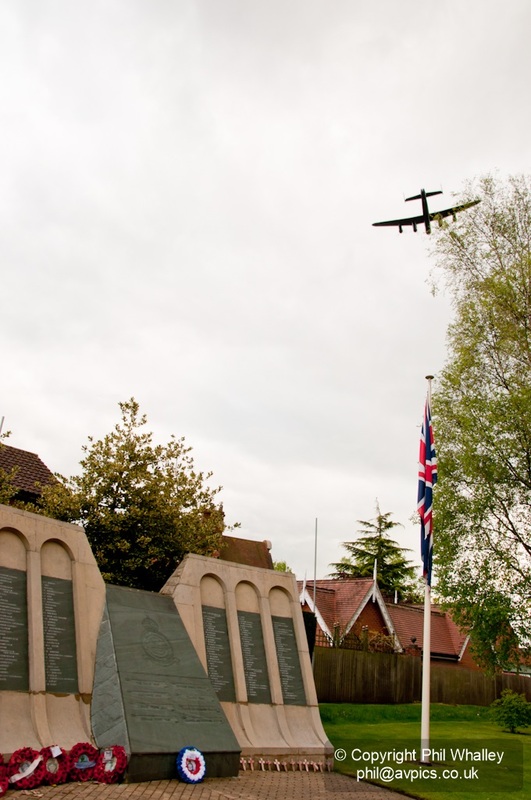 Organisers have planned fly-pasts, memorial services and parades to honour those who lost their lives. 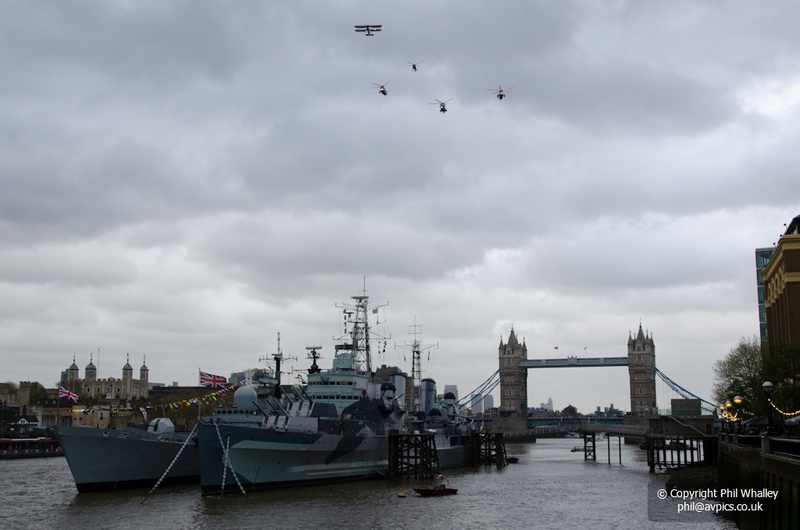 On 9 May at 19:00 BST, a flypast took place over Greenwich and ‘Lusty’ and followed the Thames to overfly IWM ship HMS Belfast. 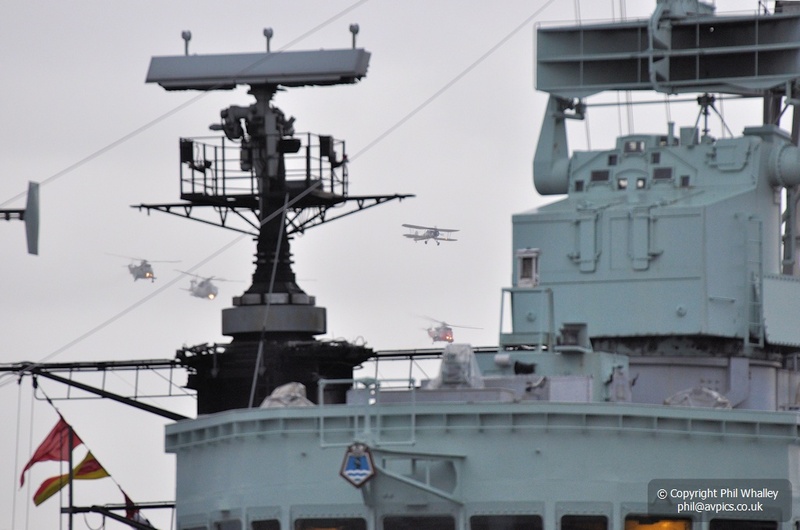 The Royal Navy Historic Flight’s Swordfish LS326 – which operated from Biggin Hill – led a Navy Lynx, two Sea Kings and a Merlin in atrocious conditions. A surprise addition (to myself anyway) was a tail-end Charlie in the form of Plane Sailing’s Catalina from IWM Duxford – a highly appropriate addition. Belfast is a veteran of the Arctic Convoys and was also a focal point on the day for events commemorating the relationship between the Allies and Russia. 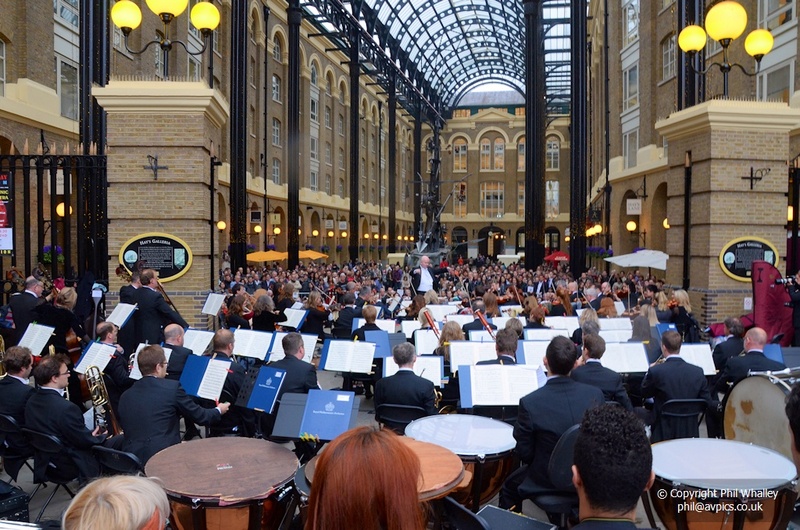 Titled Victory Day London, a gala performance by The Royal Philharmonic Concert Orchestra in The Hay’s Galleria commemorated the extraordinary contribution made by British and Russian sailors in the treacherous Convoys of 1941-1945. 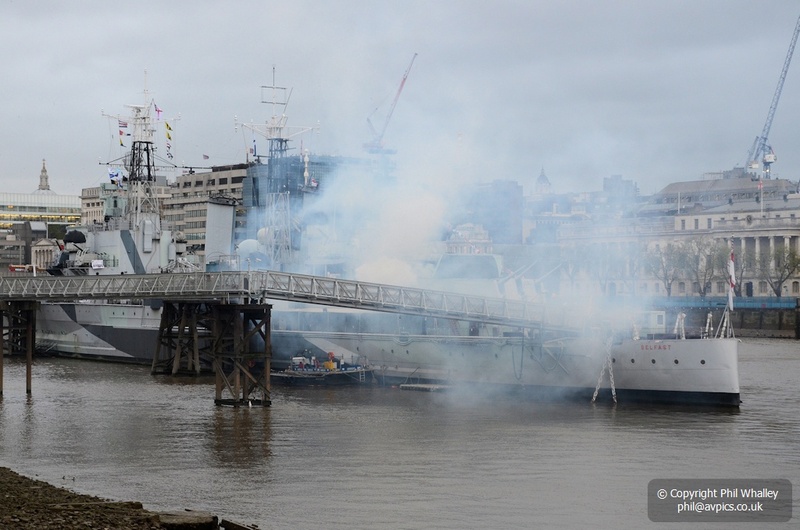 This special, free to attend concert featured one of the world’s great orchestras – conducted by Benjamin Pope – playing popular classics, culminating with the epic Tchaikovsky’s 1812 Overture accompanied by live ‘cannons’ from HMS Belfast. Robin J Brooks, publicity contact for the Biggin Hill Heritage Hangar, paints the story: ‘To the people of Kent Sunday August 18, 1940 was like any other Sunday since the war had started. Some were at Church, some were cooking a Sunday lunch whilst others were walking in the glorious August sunshine. What was different was that across the English Channel, preparations were being made by the Luftwaffe for a fierce assault on the airfields of No. 11 Group, Fighter Command. At Biggin Hill, a key sector airfield, Nos. 32 and 610 (County of Chester) Squadrons were at readiness awaiting the call to scramble. The former squadron flew the Hawker Hurricane whilst the latter the Supermarine Spitfire. The first mass raid came shortly after midday with Biggin Hill one of the main targets. 32 Squadron were the first to be scrambled followed by 610 minutes later. A short distance away Kenley, Croydon and West Malling were also subject to ferocious raids causing loss of life and many injuries. By the evening, Biggin squadrons had lost five Hurricanes destroyed with two damaged together with two Spitfires damaged. There were injuries but no loss of life. Former Spitfire pilot Warrant Officer Maurice Macey visited BHHH on Friday 22 March to help publicise a new event, titled ‘A Musical Tribute to the Few’. 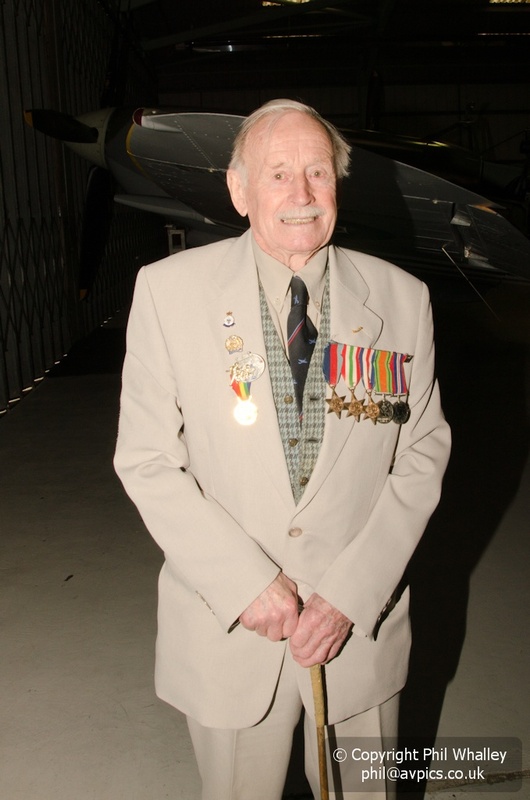 Maurice, 89, from Eastbourne, Sussex, flew his 41 Squadron Spitfire during D-Day in 1944. He was shot down in France and spent the rest of the war in a POW camp. 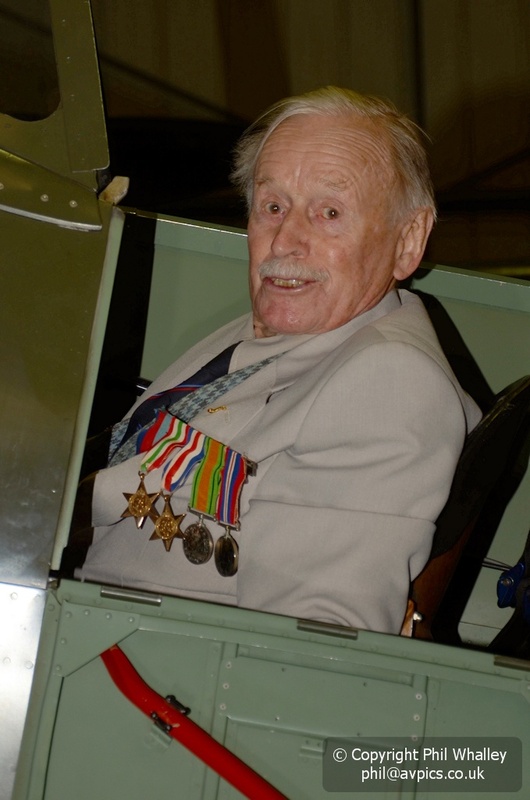 However, when he was repatriated to RAF Duxford, Cambs, Maurice was signed up to fly a Spitfire in the first ever flypast over London, which was led by Squadron Leader,Douglas Bader. Maurice couldn’t be restrained from climbing up into one of BHHH’s Mk IX Spitfires! Biggin Hill is to commemorate that momentous day on Saturday August 17 2013 with a spectacular concert. 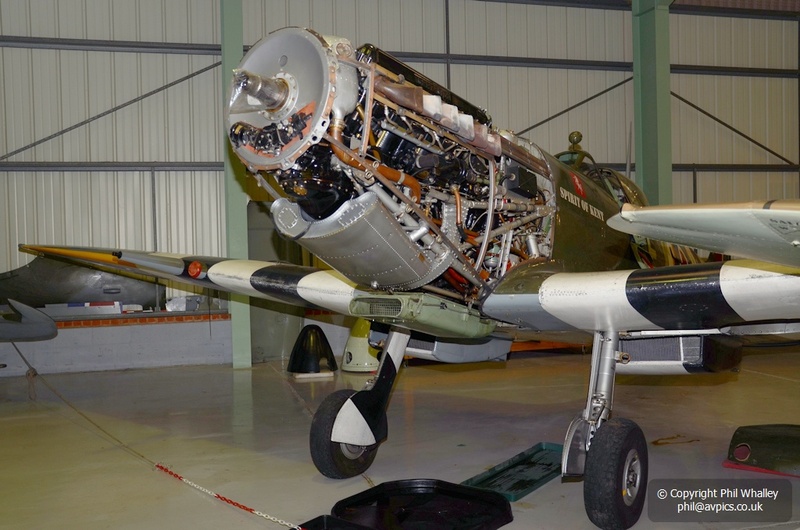 The Biggin Hill Heritage Hangars ‘A Musical Salute to the Few’ will feature music by the RAF Central Band interlinked with flying by all of the aircraft in the collection. Colin Hitchins, formally the organiser of the Biggin Hill Air Fair said “This unique event gives us the opportunity to celebrate what Churchill called ‘ his few’ and Dowding called ‘his chicks’ together with the many groundcrews who laboured under adverse conditions”. Squadron Leader Andy Pawsey, creative director of the event and historian said “To have the opportunity to tell the story at the most famous of all the Battle of Britain fighter stations is an incredible privilege. 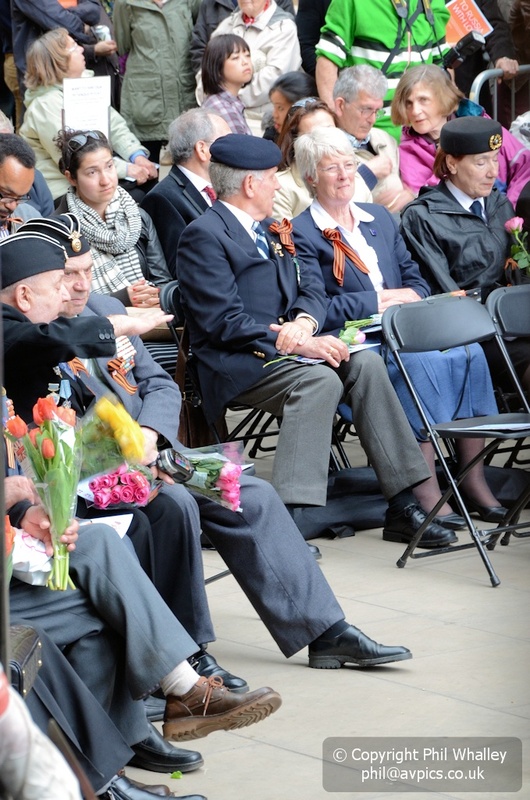 The event will appeal to everyone who has respect for ‘Britain’s Finest Hour’”. The event will take place around the still extant wartime E pen which gave protection to the fighter aircraft whilst on the ground, and will include video screens, lighting and role play to accompany the orchestration and flying displays, with actor and pilot Martin Shaw (The Professionals, Judge John Deed) providing some of the commentary.